In this episode Ben Askren and Matt Dernlan breakdown the Oklahoma State vs Iowa dual. Oklahoma State’s Gallagher-Iba Arena was packed with over 13,000 fans in attendance. They watched their Cowboy’s secure a 15-0 regular season record defeating Iowa 27-12. Askren doesn’t know if he’s ever witnessed Gallagher-Iba Arena that loud. Dernlan and Askren also appreciated the energy and display of emotion in John Smith. Coach Smith has been a part of Oklahoma State’s ... See More program, and this rivalry, his entire career. To see him overwhelmed with pure joy was something special. Piccininni escaped in the second period then locked up a cradle to pin the defending NCAA champion, Lee, who hadn’t been pinned since 2009. Dernlan talks about how difficult it is for anyone to replicate a dominant freshman season their sophomore year. Your sophomore season, everyone has already studied all the details and tendencies in your game. On record, Lee is having a better season this year so far but the pair agree his competition has shown better performances against him. Askren says even with Lee’s opponents in the know of how he comes out the gate, with high energy and how good he is off bottom, they don’t realize his strength until they’re faced with it. Overall, the rest of the 125 lbs weight class is not allowing Lee to get the early takedown or take it easy when they’re on bottom. Dernlan refers to this another level of desperation. Askren talks about how hard adjustments are to make especially if you’re used to doing something really well for so long. Dernlan has a feeling that Lee mostly needs to sort out his mental game and the physical part will come along. No. 2 Fix got the 2-0 win over No. 3 DeSanto. Askren and Dernlan agree Fix secured the takedown at the end of the 2nd period. They’re not sure how the ref missed it but they can sympathize with the unenviable position the ref was in. In front of 13,00+ screaming fans and two head coaches in your ear, this ref did a good job overall. Fix was able to hold DeSanto double laced the entire 3rd period. Askren and Dernlan agree that after about 10-15 seconds it should be stalemated in that situation. Brock got the close win 6-8 over Murin. Brock seemed more dominant than the score entailed. Dernlan talks about how great of a start to the dual this was for Oklahoma State with three straight wins. Lugo got the decision win over Gfeller 7-4. Askren’s take is that Gfeller isn’t looking great recently more than Lugo is looking better. Stylistically, it was a fun matchup with Lugo being more fundamental and Gfeller having more funk. Dernlan thinks it was a matter of Lugo being able to impose his style and not allow openings for Gfeller. Rogers pinned Bowman at 174 lbs. Dernlan thinks it’s possible the Oklahoma State coaching staff, when deciding whether to put Rogers or Jacobe Smith at 174, thought Rogers had a better chance at getting bonus points. Askren likes Jacobe at 184 and thinks he’s just as good as he is at 174. It will be interesting to see Coach Smith talk after the season what the strategy was heading into the postseason with his lineup. Missouri beat Iowa State 23-15. A key match that stood out to Askren was John Erneste and Austin Gomez. Erneste won by tech-fall 22-6. No matter what Gomez did he kept getting put on his back. Gomez has beaten DeSanto, Roman Bravo-Young and looked good against Daton Fix this year, but he really struggled against Erneste. Yianni secured his undefeated record with a 7-5 win over McKenna. Dernlan says Yianni was more dominant than the score showed and he really controlled the match. Askren still thinks No. 3 McKenna will beat out No. 2 Nick Lee if faced against him in the NCAA Tournament. 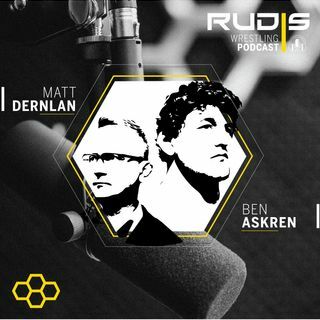 Wrapping up the podcast, Askren and Dernlan discuss what the upcoming podcast schedule looks like. There is a lot happening even with the break before NCAA conference championships. Askren’s debut UFC fight will take place at UFC 235 March 2nd. Also, Kyle Snyder and Sarah Hildebrandt will head to Ruse, Bulgaria to compete in their 2nd ranking series at the Dan Kolov-Nikola Petrov International.